WHO Guidelines Aim To Respect The Rights Of Women During Childbirth : Goats and Soda To reduce unnecessary medical interventions in childbirth and respect the woman's wishes, the World Health Organization sets standards in a report. 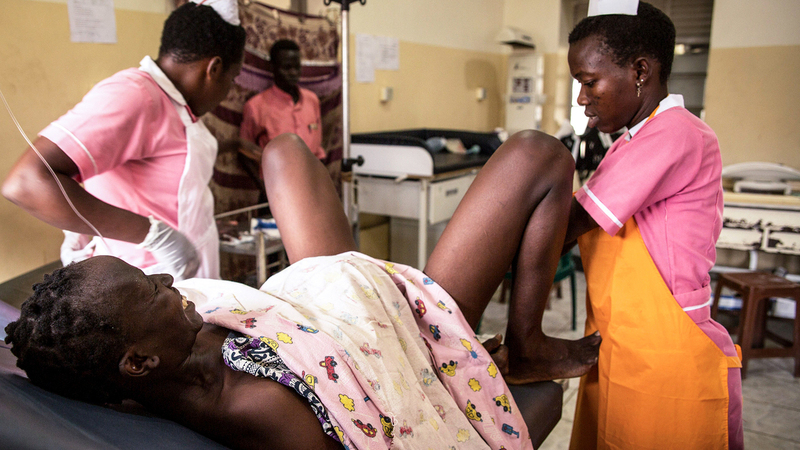 Midwife trainees deliver a baby at the Juba Teaching Hospital in South Sudan. A little history is required to understand the importance of that one recommendation, says Dr. Aaron Caughey, chair of the Department of Obstetrics and Gynecology at Oregon Health & Science University, who did not work on the report. In 1955, Dr. Emanuel Friedman studied 500 women and concluded that labor is normal when, during the intense phase of contractions, the cervix opens at a rate of at least one centimeter (about 0.4 inches) an hour. "Dr. Friedman showed that 95 percent of women progressed" at this rate, says Caughey. "And that became the standard of care." Called Friedman's Curve, the standard persisted until 2010 when a large-scale study of more than 100,000 women by Dr. Jun Zhang, a researcher at the National Institutes of Health, concluded that healthy mothers at low risk for birth complications and their babies did just fine even when labor progressed more slowly than one centimeter per hour. In 2014, the American College of Obstetrics and Gynecology put out a consensus paper co-authored by Caughey overturning Friedman's Curve, which had been followed by most doctors since the 1950s. But change in practice comes slowly, says Caughey, and many physicians around the world still consider a long, slow labor reason enough to speed it along with a drug like oxytocin or to wheel the mother into an operating room for a C-section. The big take-home message from the report is that a slow labor can be a safe labor. But just as important are the other recommendations that emphasize the kind of care women should be entitled to throughout labor and delivery. Worldwide, 140 million babies are born every year, most of them without complications to mothers or babies. But the recommendations emphasize that too many women suffer during childbirth or don't have the kind of birth experience they want. The new WHO recommendations include allowing a woman to be accompanied by a companion of her choice during childbirth, honoring her decisions about pain management and delivery position, and providing her with confidentiality and privacy. These guidelines are important all over the world but are particularly relevant in poor countries where resources are scarce and women in labor are often crammed into overcrowded wards. For a closer look at the overall guidelines, we spoke with Dr. Olufemi Oladapo, medical officer in the maternal and perinatal health team at WHO and an author of the recommendations. This interview has been edited for length and clarity. The new recommendations say that a long, slow labor is not a good reason in itself to give drugs to speed labor, perform a C-section or otherwise medically step in. Can you talk about that specific recommendation? This is a game-changing kind of recommendation. It goes against an ages-long benchmark categorizing how quickly labor should progress. Previous thinking was that less than one centimeter per hour was abnormally slow. But we now know that this benchmark is unrealistically fast for some women, and interventions to correct the rate of dilation can do more harm than good. If a woman is dilating slower than one centimeter per hour, as long as she's making some progress, she can still have a vaginal delivery. Using that old, fixed rule for every woman doesn't make sense. Just like in many things, humans tend to differ. What do women themselves want in the childbirth experience? Women want to be involved in making decisions. They want a sensitive, caring, well-motivated staff taking care of them. They want to be in control of the process. And, of course, they want a healthy baby and to be healthy themselves. That's what women are saying they want. The guidelines emphasize respect and dignity. What are some instances of "disrespectful and undignified care" referred to in the report? My department published a review of disrespect of women globally during childbirth. It's worse in some places than others, but it's everywhere. It has to do with physical abuse, like slapping the woman on the thigh during delivery. Or yelling and shouting at her to push the baby out. There is negligence, for example, if the woman is left alone for long periods during labor. Are cultural differences taken into account in these recommendations? Yes. An example is the recommendation having to do with birth position. A woman should be allowed to choose the position she wants, maybe squatting or sitting. That might be the position of her culture. Many of these recommendations are aimed at encouraging a normal, vaginal delivery for healthy women not at risk for medical complications. What if some women request cesarean section even though it's not medically necessary? We make clear that if someone wants an intervention, it's the responsibility of the provider to explain the pros and cons of an unnecessary medical intervention. In some cultures, the medical intervention is considered the better quality of care. Now that the policy has changed, I understand that's changing. But an invasive intervention means the woman is taking an extra risk. You have to explain to the woman that even in a high-income setting, the risk of a cesarean is not zero. How will you spread the word on these recommendations? There has been a lot of social media. We'll hold regional conferences: Africa in April, Southeast Asia in June. Others will follow. Each region can run individual workshops. What do you hope comes from these guidelines? We hope that every woman receives care that maintains her dignity from the time she walks into a facility until she is discharged.